This is the commode you can take with you. Useful situations are numerous where one would need a commode but none are provided, ie., camping. With the Voyager Folding Travel Commode you can take it with you. 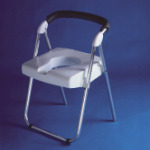 The commode folds easily and fits into the trunk or back seat of a car. The Voyager is made of non-corroding aluminum with a plastic seat area. An attachable pot is included with the Voyager. 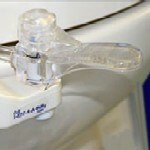 You can use the Voyager with the pot, without the pot over a toilet or even as a portable shower chair. The Voyager is an Independent Living Design award winner. Maximum user weight is 275 pounds. Shipping weight is 16 pounds.